Lene Lovich fronts Skinny Puppy with help from The Voluptuous Horror Of Karen Black and Wendy O. Williams. DANDI WIND is a duo; Dandi Wind (vocals/performance) and Szam Findlay (music). This is the debut CD EP (with a bonus video). Performance art industrial is tempered with humour and intelligence much like the classic days of Devo, Jello Biafra and others. The wild live shows have set the buzz; #3 on the CITR chart; on-air interview with Nardwuar The Human Serviette; #104 on the Earshot National College chart; a Nov-Dec tour with Nanobot Auxiliary Ballet; Exclaim Dec/Jan 2005 issue write up; and more! Szam Findlay's previous solo cd, Die Hautfabrik, was released by Resonant Recordings UK, who put out Acid Mother's Temple and Esmerine (godspeed you black emperor side project). The cd received favourable press from BBC, The Wire, Stylus. All Music Guide and Tigersushi. 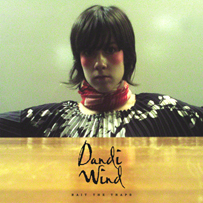 On the Dandi Wind cd, the rhythms on "Umbilical Noose" and "Drawing Straws" were contributed by Planet Mu Records dance superstar Bit Meddler (of "shitmix 2000" infamy). Full-length CD/DVD later this year; "Concrete Igloo". We started the Dandi Wind project in late 2003 as a way to meld our love of theatre/performance with challenging but not inaccessible music. Our songs are about honest incidents that surround us. Since we live in the downtown eastside of Vancouver (the most depressed slum in Canada; the most junkies per capita in North America) our songs are sometimes grim... Currently I live next to the train tracks and the rendering plant where they turn dead pets into glue while pumping cancerous smoke and industrial noise into my mind all day. I love to perform and make people FEEL something. If I can walk offstage unaided then I've not delivered a true Dandi Wind performance. PRESS QUOTES: This B.C. duo should be brought to the attention of anyone who digs the spastic art damage and raw electronics of Les Georges Leningrad, Chicks on Speed or Nina Hagen. While Dandi Wind's sweaty, switched-on, punk-ademic performance art is ideally a live experience, the neato lo-fi tunes and shouty, krauty vocals hold their own on plastic. Vancouver's Dandilion Wind Opaine - sculptor, singer, freak-out artist - and her sidekick on the keys Szam Findlay nail that downtown now sound (and of 25 years ago, but anyway...), perhaps because the urban malaise is that much more genuine, given Opaine's boonie-bound youth. "A cross between Bjork's eccentricity and avant-garde fashion sense and the raw musicality and edge of Peaches - Dandi Wind is destined to be one of the most intriguing acts to come out of Vancouver in a long time." "An electro-fied slice of tribal dance accentuated by Eastern-tinged synths and Wind's beautifully exotic vocals that bring both Siouxsie Sioux and the Slits' Ari Up to mind." "Overall, Dandi Wind's Bait the Traps is undeniably cool and quite captivating. The EP's challenging experimental sound only slightly masks, and, in fact, enhances, its underlying pop material and refreshingly quirky appeal for an outing that is bizarrely accessible." For current live dates, press, videos and photos - please visit the Dandi Wind site.